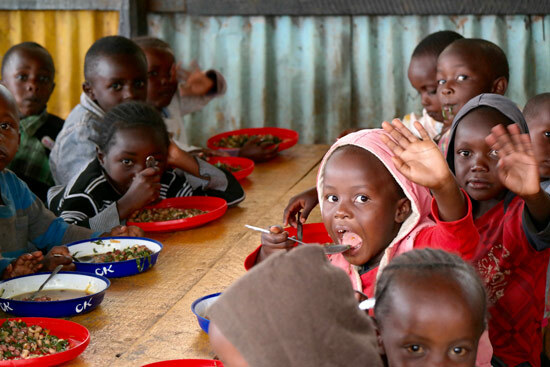 Pat’s Feeding Program is organized by Pat Dixson, a British native of Kenya. She operates a bi-monthly feeding program for the elderly and single women who are HIV positive. During the winter, she also provides blankets and other basic needs. This program serves approximately 400 individuals/families. In addition, Pat also collects used clothing she secures from friends and churches and distributes the items occasionally at the feeding program. Many of the food recipients walk long distances to pick up these needed supplies. Pat also provides notes to physicians when asked, so those who seriously need medical attention can receive it for free. Pat is dedicated to this humanitarian service and works diligently to maintain funding to sustain the feeding program. Global Connections and team members support this program, which can always use more funding as Pat continues to encounter increasing costs. This program provides one meal weekly to an average of 60 children per week. It is overseen by Evans Katana, a Kenyan pastor and bible college administrator. During the school holidays (twice each year), Pastor Katana also provides a retreat/camp for the children emphasizing learning skills, healthy relationships, and personal wellness.